min_sig any number as the minimum significance (optional). Will return only collocations with significance >= min_sig. 1,2,3333,75334, etc. You can test the API and develop your own application with our test translate API – for free. The test API contains only a subset of the complete collocation database. Only highly significant collocations (significance > 30,000) are included. Therefore only 6,000 collocations are included in the test API. 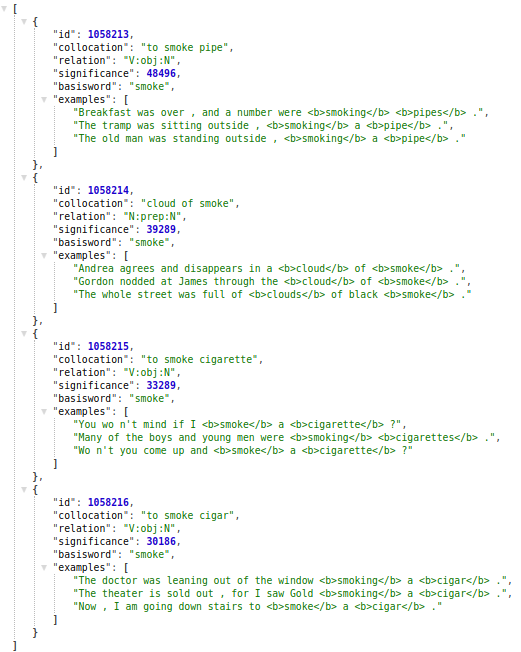 The paid API (see below) contains more than 4 million collocations. "The old man was standing outside , <b>smoking</b> a <b>pipe</b> ."